Cook beef in 10-inch skillet over medium heat 8 to 10 minutes, stirring occasionally, until brown; drain. Stir together Potatoes, Sauce Mix, boiling water and milk in ungreased 2-quart casserole. Stir in beef and 1/2 cup of the cheese. Bake uncovered about 30 minutes or until top is light golden brown. 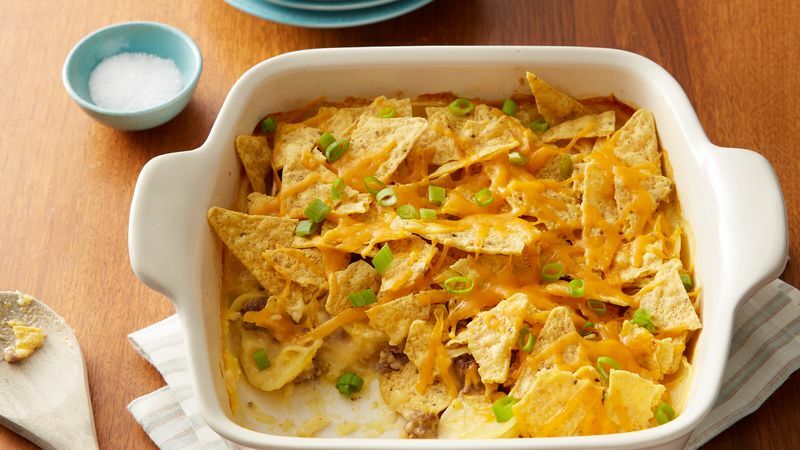 Sprinkle chips over casserole; sprinkle remaining cheese over chips. Bake 5 minutes longer or until cheese is melted. Let stand 2 minutes before serving. If you're really a planner, consider cooking up several pounds of beef ahead of time and freezing it in resealable plastic bags in 1/2-pound (1-cup) batches. Then you’ll have it on hand for yummy dishes like this! Replace taco-seasoned cheese with pizza-seasoned cheese and use crushed crisp breadsticks instead of the tortilla chips. Sprinkle hot casserole with sliced ripe olives, and you have Pizza Potatoes Casserole!